Models have a role to play in all phases of the design process, not just reframing and envisioning. 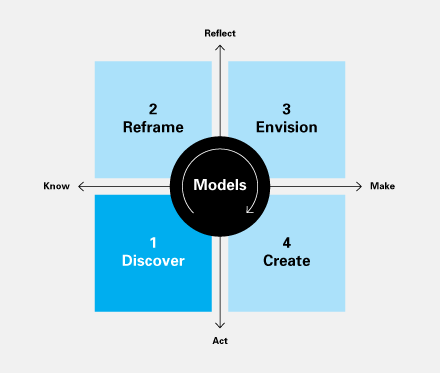 Models frame and guide discovery and are also part of what we ultimately create and deliver. 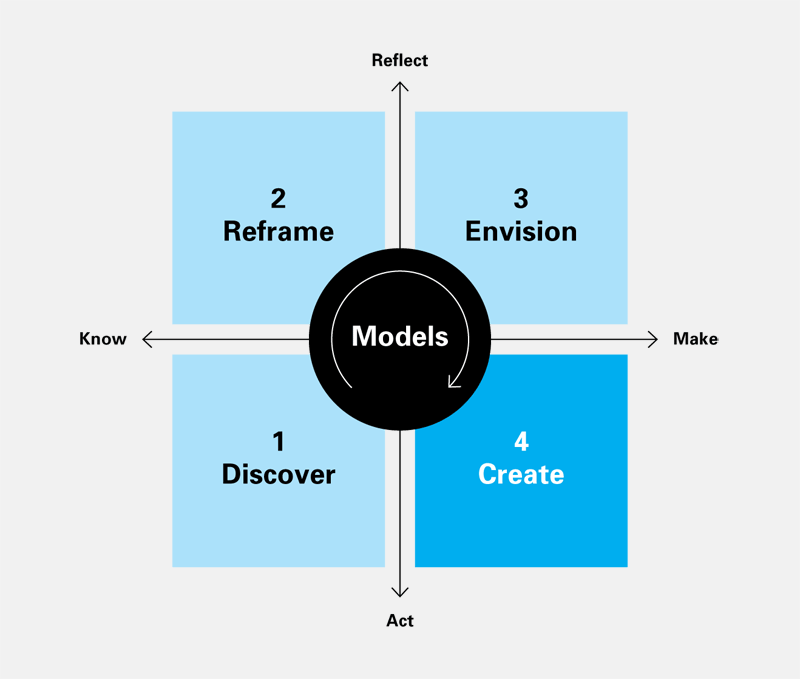 As the objectives of problem solving change with each phase of the process, so too does the role of models. The type of model we use changes to support the context and the discourse that needs to take place. Moreover, models can aid the transition from one phase of the process to another. Over the course of several years of working with cross-disciplinary teams in innovation consultancies, I had the opportunity to create and evolve models in combination with other design research methods when solving complex problems in digital system and service design. Some situations called for new models when other tools fell short; other times, existing models were borrowed, adapted, and incorporated to work with existing design research tools. This work further evolved as part of the Design Methods Practice at Cheskin Added Value where Jan Yeager and I developed many models for working with customer and business research. They proved to be an effective means of gaining insights into open-ended problems and framing opportunities. A taxonomy of models began to emerge as a result of finding models that were repeatedly called for within the work. 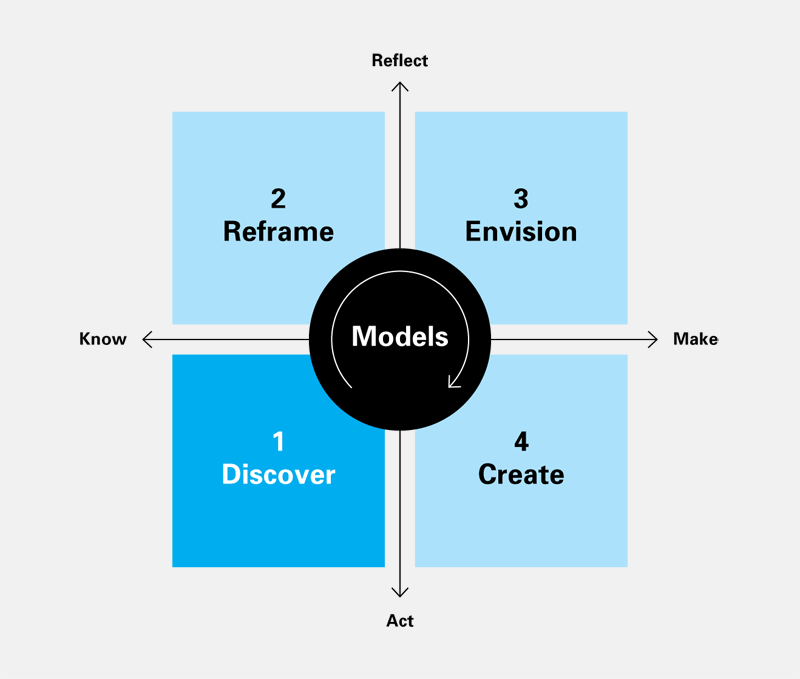 What follows is a description of the roles models play in each phase, along with a list of model types that are often useful in that phase. This taxonomy is partial and preliminary, but it invites discussion about what model types should be regularly used in the design process. This model of the design process is similar to the analysis-synthesis bridge model proposed by Dubberly, Robinson, and Evenson, and as they noted, it shows up frequently in design practice. Frameworks are used for capturing, organizing, and mapping data to one another in ways that elicit patterns, reveal initial insights, or enable information to be extracted from the data so that it can be visually represented for further review. A simple Excel spreadsheet can work for creating a framework that organizes data collected during research. Participants are organized along the x axis. Research topics are listed along the y axis. As research data is collected it can be populated for each participant by topic. This allows for comparisons and contrasts to be made easily and efficiently upon completion of the research. Persona modeling is the process of representing typical users and their goals. The term “persona” comes from the Latin term dramatis personae, the characters of the story, which was popularized by Alan Cooper as a means of clarifying the audience for a software application and helping a product team (especially engineers) understand they may not be the audience. Personas can be defined by dimensions that characterize and distinguish customer segments from one another. Persona dimensions are selected to inform the product or service experience under exploration. To this end they may include demographic information, attitudinal information (key drivers, triggers or motivations), behavioral information (habits and practices, barriers, experiences sought, needs and desires), and information about desired outcomes or associated trends. These are systematic inventory and analysis tools used for documenting and assessing the current situation. They’re useful for identifying patterns and comparing and contrasting attributes. Audits can be adapted to understand a broad range of things from the coherence of a brand identity system to comparing regional product design semantics or company competitive offerings. A simple grid can be used to organize and label similar content types into groups where they can be visually compared and contrasted. Observations can be noted in the context of the framework. These reveal cultural attitudes and behaviors making it possible to further decode their meaning. These frameworks/databases consist of visual imagery, video, and text gathered from readily available sources in the culture (advertisements, retail environments, material artifacts, and the Internet). Using a database to analyze the content automates what a framework grid can simulate (though less easily). Tags are assigned to categorize content for analysis. A semiotic analysis includes sorting the categories across multiple dimensions: gender, age, status, context, ethnicity, occasions and rituals and their semantic qualities (how they look, sound, taste, smell, and feel). The resulting insights into cultural attitudes and behaviors are further analyzed to reveal their meaning in the culture. Ecosystems provide a visual mapping of relationships between a constellation of players in a market. They can also be used to describe the interplay of factors impacting a customer experience. They provide “the big picture” for understanding the cause and effect behind why things exist as they are. Market ecosystems depict a systems view of relationships, territories, interactions, and conflicts to reveal underlying forces at work in a market landscape. Customer ecosystems visually map the interrelationships between factors that define a customer experience. They might describe the ways in which new technologies are influencing emerging behaviors or depict how lifestyle factors are impacting planning, cooking, and shopping for meals. These are used in mapping recessive trends to corresponding dominant trends as a means of projecting emergent trends. Factors contributing to the trends are identified in each phase of the map. They provide a context for why a trend has occurred and whether or not it may continue in the future. Trend maps start with a time frame that spans the past, present and future eras being investigated. Corresponding causal factors are listed under each era. This sets up a framework upon which past customer behaviors can be recalled and then followed into their present-day manifestation and projected into potential futures. These models are a means of associating customer motivations to their behaviors and the experiences they seek and either may or may not achieve. They are organized sequentially starting with customer motivations or action triggers. Following this is visual constellation of their interrelated behaviors. The model culminates in outcomes that may take the shape of benefits, aspirations, or meanings achieved. These are sometimes referred to as customer journey models. They provide detailed descriptions of customer behaviors in the context of a product or service experience to reveal pain points (opportunities) and identify what’s currently working. Depending on the nature of the experience these models may or may not be sequential. While corresponding attitudes can be mapped to the behaviors, the emphasis is on deconstructing behavioral elements and their relationships to each other for further examination. These models break down a sequence of activities into their component parts, to provide a context for understanding when things happen and why. Process models can be used to describe systems, customer environments,or customer pathways and decision points throughout stages of a purchasing process. Insights may take the form of decision accelerants and deterrents, iterations, considerations, and rationalizations. 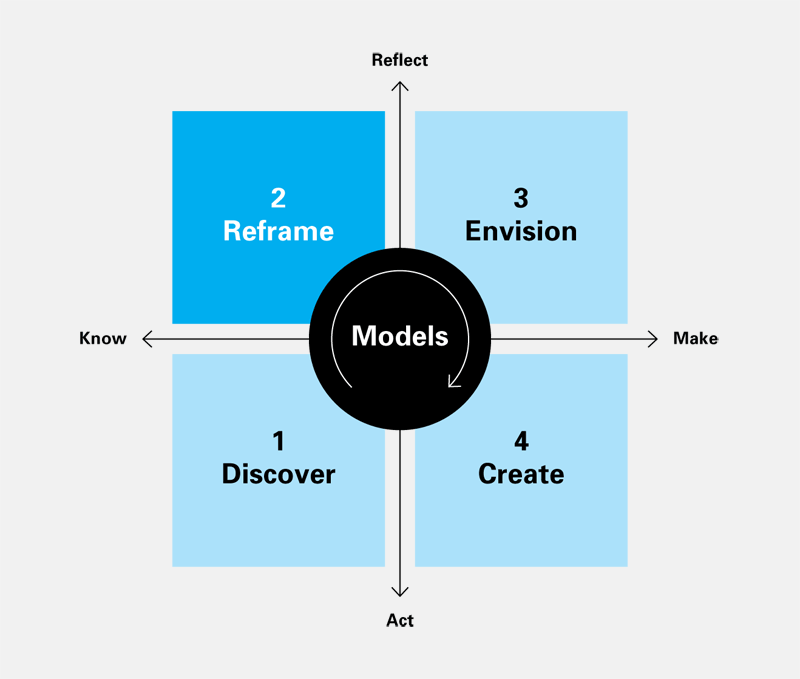 These framworks can be used to evaluate aspects of a customer experience, characteristics of a brand, or attributes of a product or service. They can take several different forms depending on the content and objective. Continuums consist of opposing attributes at each end of a spectrum. Multiple spectrums can be created to describe different aspects of an experience, etc. Matrices plot evaluation criteria on an x/y axis and are used to compare, contrast, or score key aspects of a customer experience. This can be used as a basis for making recommendations to clients about what they should stop doing, continue doing, and consider doing. 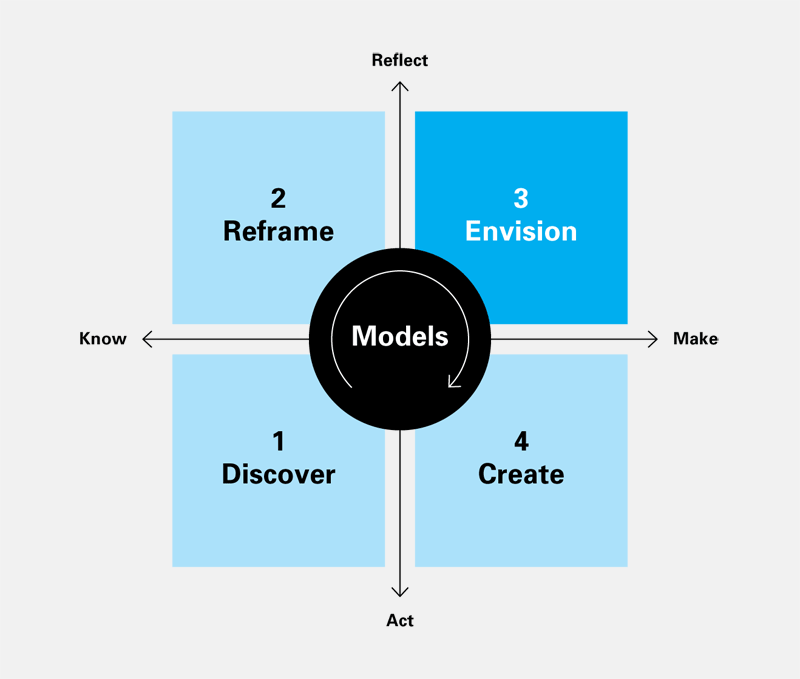 These models are used in facilitating participants through an ideation session. They combine various aspects of a solution that need to be present when generating ideas or solution-oriented scenarios. They’re an integral part of the ideation process in a session. Depending on the situation at hand these models may lay out principles that serve as guidelines for ideating on products, services, experiences, messages or positioning. Alternatively, they may include motivations, behaviors and contexts as the components from which to generate solution-oriented scenarios for customers. These are used for plotting ideas, scenarios, or features so they can be evaluated, compared, and contrasted. Information is populated in a quadrant framework that is defined by two spectrums; one on the x axis, another on the y axis. These define quadrants representing different territories upon which information can then be mapped, compared and contrasted. Envisioned solutions are described in a high-level abstract representation of how they could take shape in terms of overall features, attributes and the experience it affords customers. A site conceptual model, for example, would provide a conceptual overview of the types of information and tools that would available. These would be clustered into categories that describe different areas of functionality and then situated into an overall site organizational scheme. These provide a systems view of the path forward for a product, service, or experience. They are a result of a confluence of customer needs, business objectives and technological capabilities as they apply to a situation. Components of the roadmap are organized in a phased approach. They describe the path for moving from the current situation to the desired future. Roadmaps range from the high-level conceptual to detailed plans for a migration that ranges from the near- to mid- and long-term. Scenarios are used to envision a customer experience in a specific context of use. They help to imagine potential futures. Scenario prototypes are exploratory and describe the types of information and tools available to users along a path they take through a product or service or device. Scenario frameworks demonstrate how design principles and tactics come to life in the context of a customer experience. For example, scenarios could describe how incremental improvements could change a current experience compared to what transformative changes would look like. Prototypes are working models for exploring or demonstrating how design principles can translate into tangible experiences in a context of use. The fidelity of prototypes varies depending on the stages of design development. Many Web design and product design firms have done extensive work in this area. These are used in working with content hierarchies. They describe relationships between levels of the hierarchy in a system as well as the content at each level. A website taxonomy is an example of an object hierarchy for evaluating existing content that’s used in determining what restructuring needs to occur. New page and templates types can be identified from the restructured version of the taxonomy. These can describe user pathways through information or provide an overview of the relationships between content, tools, and information in a system. They may also be used to describe relationships between the front and back end of a system. Examples of navigation structures include site maps, scenario tables, process flows, and use cases. A simple spreadsheet is used to create a framework for mapping content types with metadata tags and rules for searching and sorting information in a digital system. Define security access to a digital system in terms of roles and corresponding access levels to information, content areas, and website administration. May also include rules for proposing, discussing, and agreeing on content or process changes. Governance models are simple visual models and use nodes and links to depict elements of the system and text to describe the roles and privileges associated with them. Models integrate information from a wide range of practice domains and data types to reveal patterns hidden in data and identify relationships. They can integrate with a wide range of methods and tools for problem solving. As the use of models grows in design practice, questions naturally arise: What are the important models? Is there a canon of models? Which models should designers be familiar with? This article proposes a taxonomy based on my experience. I invite others to offer comments, examples, and their own version of the taxonomy. 1: Mendel, Joanne and Yeager, Jan. “Knowledge visualization in design practice.” Parsons Journal of Information Mapping, Summer, 2010. 2: Dubberly, Hugh, Rick Robinson and Shelley Evenson. “The Analysis-Synthesis Bridge Model.” Interactions, March 1, 2008. Joanne Mendel, MDes is a design researcher & strategist working in the San Francisco bay area. She has diverse experience that spans innovation & strategy consultancies, global corporations and startups. She’s evolved human-centered product, service and brand experiences across a broad range of industry sectors. Joanne’s passion is for the most information intensive aspects of design practice where she enjoys framing opportunities for customers within a business context. Her background spans design research, information architecture, semiotics and graphic design. EU Usability Net, Nigel Bevan, et al. Hi I’m an architect and urban designer believing that the received wisdom of Rittel and Archer is wrong, and that the common positions defensively taken by our profession when interrogated about how and what they design is a conceit. Naturally protagonist, as I’m doing a PhD on the subject (in a planning school!). Given the vast array of information we have, and also our evolutionary understanding of our environment, I don’t find it acceptable to allow the mythmaker (the architect) to synthesise without making accessible core data, or supporting the interactive interrogation of it. My hunch is that we have the technology and the systems that would radically overhaul Rittel and Archer’s systemic paradigm, and make the process more apt and accessible. See Proxi Design below. The approach of the designer was both systematic and intuitive, and so has been the combined result of sediment and block layout, resembling more the work of an artisan than a bureaucrat. Relations of cause and effect become more complex and cannot be conceived in a linear way since the end result cannot be known in advance but has to be built through the experiment. The diagram is the result of an intuitive understanding of natural process combined with design intentionality, rather than just a projective tool purely emanating from the designer. This methodology expands the capacity for interaction given the speed at which the changes take place in the model. This capacity to interact, produce change, read digitally and generate can be taken to new levels if we acknowledge the potential of the development of tacit knowledge to bring about interaction, not only between designer and model, but also with other stakeholders. This opens the door to a design where the physical outcomes are not necessarily fixed, but are dynamically linked to a different array of variables linked to the social formations of which they ought to be part. In order to be able to think about design methodologies that fully embrace the ideas of time, process and social formation at their core, traditional forms of representation have to be reconsidered and potentially reengineered, as discussed in the following section. The ultimate goal of design interfaces is to bring design conversations to new levels through their capacity to allow interaction with variables and the description of time-dependent processes. Conclusions Traditional ways of representation have failed to bring design ‘into’ time, prompting a preoccupation with forms rather than formations. This, it could be argued, has prevented design from helping to develop radical thinking in the territory. The use of material research as a means of dealing with the problem of time and formation opens great potentials for tacit forms of design on the territorial scale. However, consideration is required as to how we treat the forms of representation of matter if we are to extract its full potential within territorial discourse and ultimately transcend the pitfalls of designing fixed spatial forms. As this article contends, it is the consideration of design as protocol, interaction and interface which may lead the way to modes of thinking that privilege formation over form and process over objective.